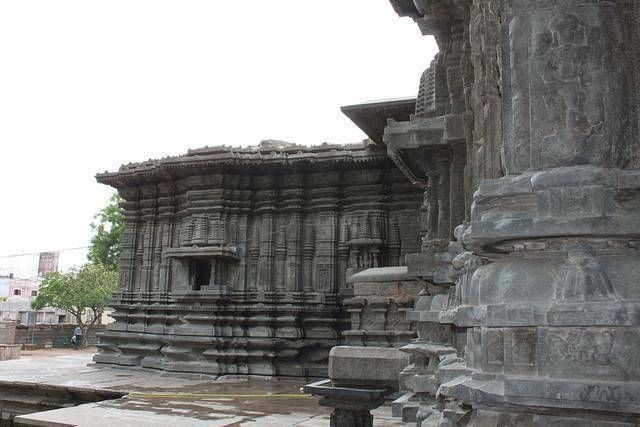 Much famed Thousand Pillar temple is the standing example for the Kakatiya Empire’s culture and architectural style. The temple is located on the highway linking Warangal and Hanamkonda. Inside the temple there are three shrines dedicated to Lord Vishnu, Lord Shiva and Lord Surya. The pillars are built in such away, not even single pillar barricades the other shrines in the temple to be viewed. The temple was established in 11th century by King Rudra Deva of Kakatiya Dynasty. The ancient Vishwakarma Sthapatis of Kakatiya Dynasty had done a marvelous work in this temple. The Nandi statue of the temple was carved out of Black Basalt in Monolithic style and you can feel how well it was polished while touching the Nandi Statue. The platform over which the thousand pillar temple was built was actually elevated up to one meter. There is a star shaped portico which was supported by 200 pillars in front of the temple.